Looking for a unique way to satisfy your diners’ salted egg fix? You’ll love this fuss-free Salted Egg Lava Cheese Tart recipe, guaranteeing an explosive burst of buttery, cheesy and oozy goodness with every bite. Sift flour and add in grounded almond. In a mixing bowl fitted with the paddle beater, beat the margarine and icing sugar lightly. When the mixture begins to form dough-like consistency, wrap with cling film and chill at least 20 minutes before use. On a floured board, roll the dough to a considerable thickness, and cut with a plain round cutter. Poke the base of the tarts with a fork. Chill for about 10 minutes before bake. Blind-bake at 160°C for approximately 15-20 minutes, depending on the size of the mould used. Tart base should be fully cook and golden brown in colour. In a mixer bowl, cream margarine and icing sugar till light. Add in salted egg yolk powder, followed by coconut cream and salt. Refrigerate the mixture till firm. Portion into 15g balls and freeze till solid. Combine cream cheese, caster sugar, and yoghurt in a saucepot over low heat. Gently whisk until ingredients are melted. Add in mozzarella cheese and butter. Once melted and smooth, move away from stove and add in the egg white. Return pot to stove and whisk constantly until thicken and smooth. Do not over-cook! Transfer to a container and refrigerate until set. Preheat oven to 230°C top grill mode. Pipe a little of the cheese filling onto the base of the baked tart base. 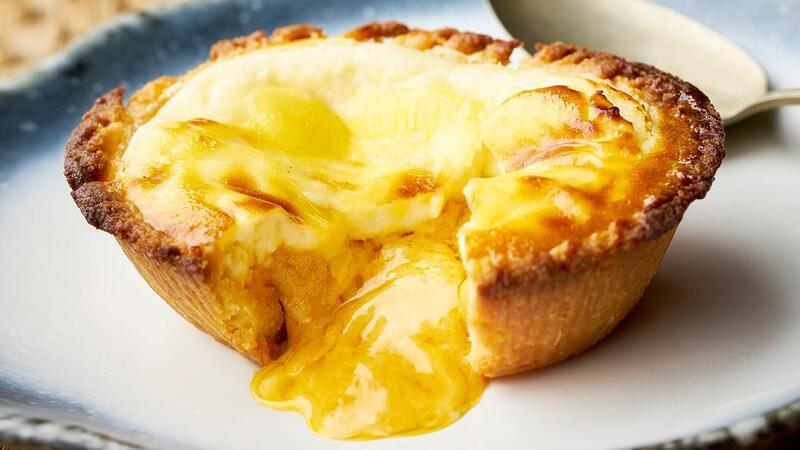 Place the balls of the salted egg custard in the middle of the tart, and topped up the cheese filling to cover. Then brush with beaten egg yolks. Place the tray on the upper rack of the pre-heated oven for approximately 6 minutes. Once baked, remove from oven and serve. Note: When using convection oven, adjust to 230°C; when using combi oven, adjust to 200°C.